Copyright © 2013 Ali Djeffal et al. This is an open access article distributed under the Creative Commons Attribution License, which permits unrestricted use, distribution, and reproduction in any medium, provided the original work is properly cited. Polytetrafluoroethylene reinforced with glass fibers is a composite material widely used in industry mainly for the manufacture of seals at the level of the rotary shafts of vehicles and stationary floor machines such as turbines and compressors. However, due to elastic and viscous-plastic properties of this material, it wears quickly under the influence of some external parameters during operation. There is therefore material loss, increased clearance and loss of sealing. 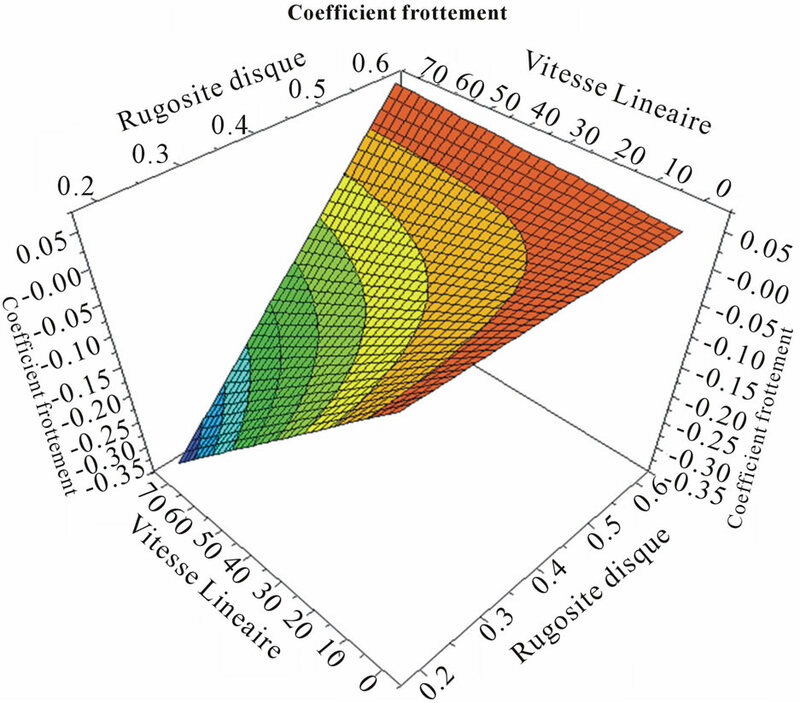 This work summarises a series of tests carried out with this material in order to analyse the variation of the friction coefficient due to the roughness of the work piece brought into contact with the PTFE, the linear velocity of contact between them and material yield strength. To do this analysis, we used the method of unconventional design of experiments to model the behaviour of material and consequently make decisions to reduce this wear. 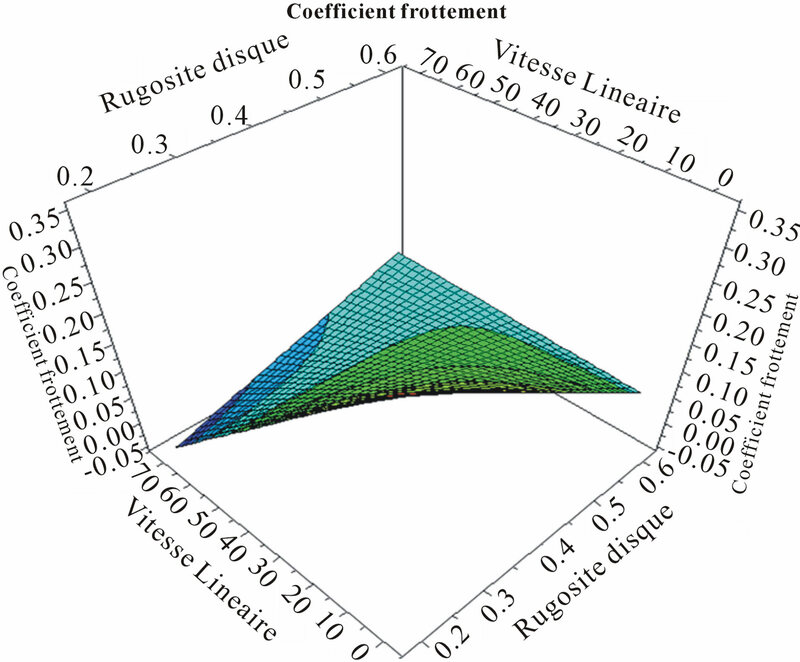 The results are shown and deeply analysed in the following text as a polynomial mathematical model, graphs, contours and response surfaces illustrating the holding of this material under the effect of the three parameters mentioned above. 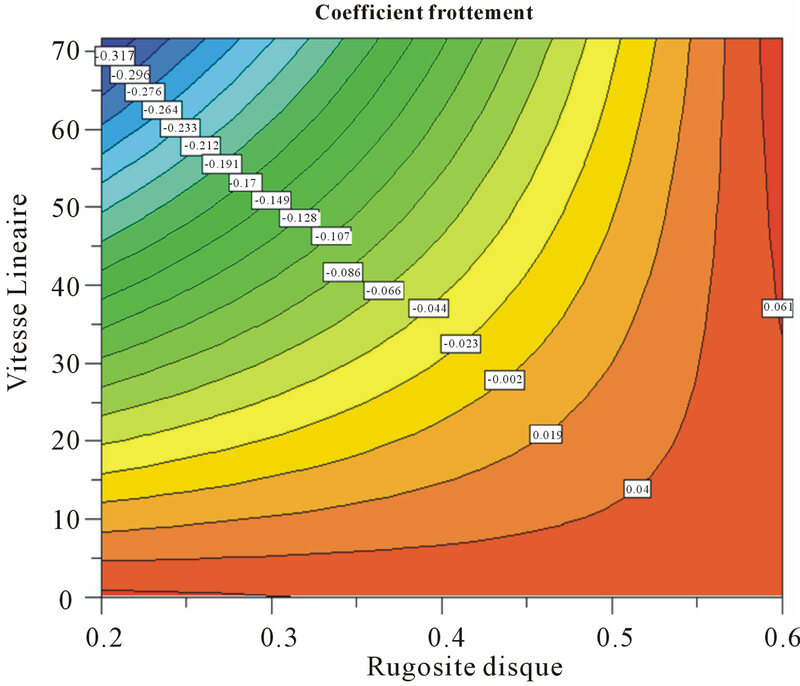 The previous PTFE samples enriched with chopped glass fibers are not subjected to axially force this time, contrary to the force applied radially. The advantage of this method is the relative linear velocity at the contact sample-disc and the applied pressure remains constant. Under the action of the weight “P” applied on the sample, it comes into friction with the rotating disc whose roughness changes from experience to another; it is expressed by the values of Ra. Tangential friction force appears at the point of contact and is equilibrated by measured force Fm on the lever. The calculation of the moment relative bench axis caused by 2 forces gives the coefficient of friction. Knowing the values of frictional force Ft by calculation and the weight P, we determine then the friction coefficient. 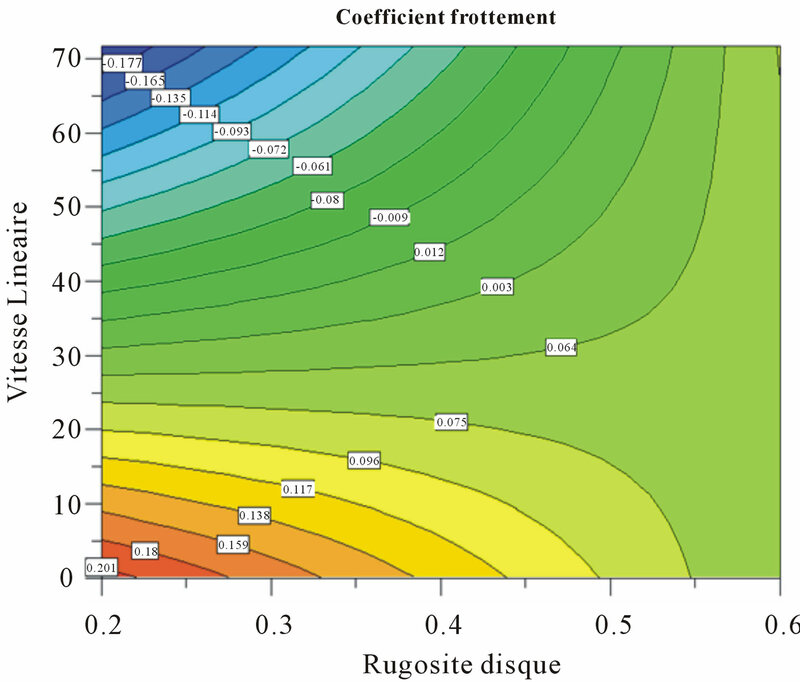 Contrary to what was done before, the samples of PTFE enriched with chopped glass fibers were not subjected this time by axially force or pressure, but by radially force (Figure 1). The advantage of this method is that the relative linear velocity at the contact of seal and disk and the applied pressure remain constant [1,2]. tion force. Knowing the values of the frictional force and weight, then it determines the friction coefficient μ. 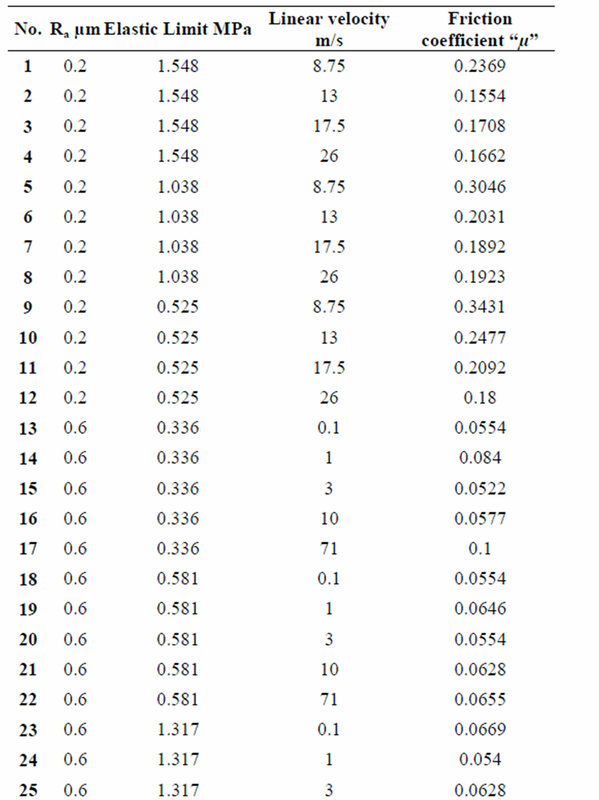 To apply the method of design of experiments, 37 experiments were carried in which three external parameters change values [3,4]. These are the roughness of the disk that depends on the rate of the PTFE [5-7] fibers in which “Ra” is 0.2 µm and 0.6 µm, the rotational disk speed that predetermines the linear velocity at the contact point between sample and disc, it varies from 0.1 m/s to 71.7 m/s and finally the material characteristic namely the yield point (Elastic limit) that varies between 0.525 MPa to 4.994 MPa. These experiments were performed by varying three parameters at the same time following specific process to create necessary conditions to form a matrix of unconventional design of experiments. 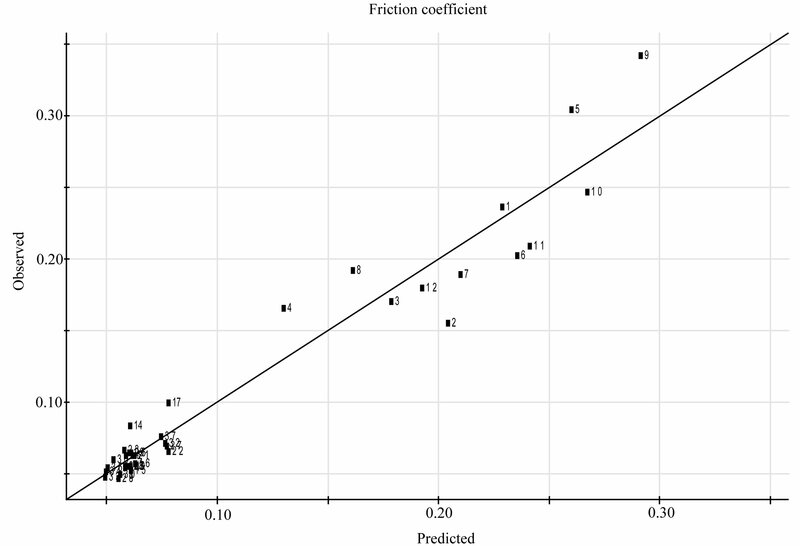 We conducted 37 experiments and calculate the friction coefficients; the results vary from 0.0466 to 0.3431 and are represented in responses of experiments column. 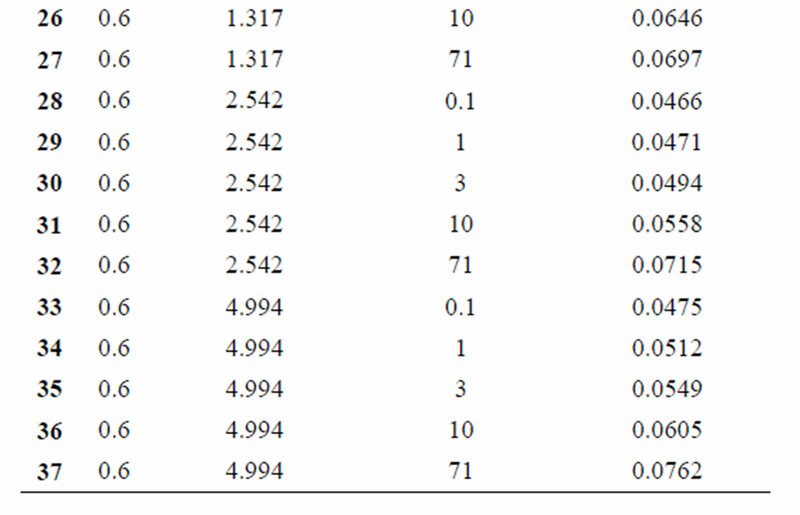 As shown in table 1, the responses are obviously the average of 3 consecutive tests conducted in the same working conditions without changing the parameter values. At first sight, we see that increasing of disc roughness “Ra” increases the coefficient of friction “μ“ by the positive coefficient of x1, while the increase of the elastic limit of the material in passing from sample to another, and the linear speed at the point of contact are reduced by the negative sign of the terms in the polynomial. The final action depends of course on the simultaneous actions of the three parameters and their interactions. Table 1. Experiments design matrix. deviation is recorded at the experience number 17 where it reaches 0.0518425 or 15.1% of the measured value, while the small deviation is 0.000609618 at experience number 21 or 0.97% of the measured value. Figure 2. Deviations of experimental points compared with mathematical model. 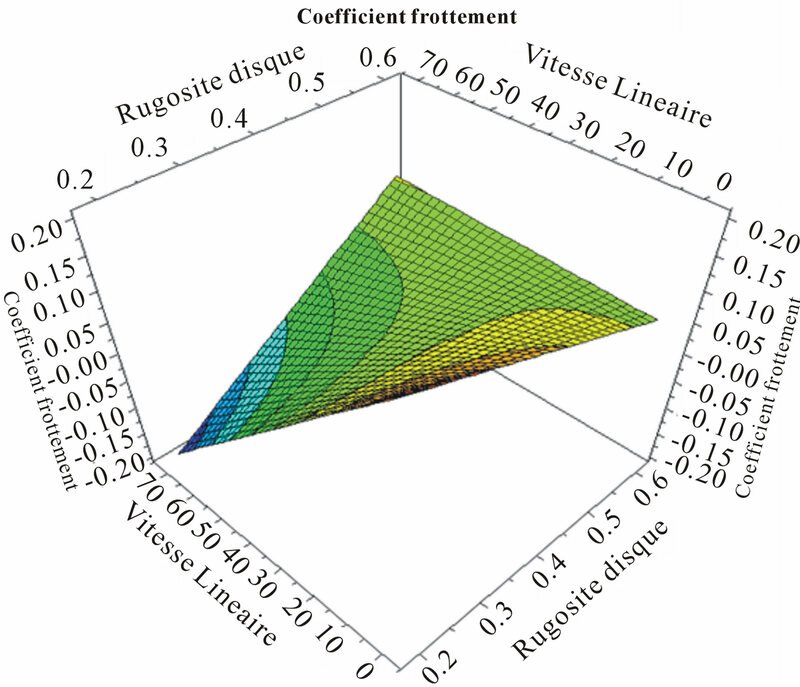 combined with small roughness values of the disc (Figure 3). The contour that defines the coefficient of friction of 0.012 is the positive limit values, beyond, these are negative values, and they do not really existing. It is delimited by a roughness of 0.2 microns and velocity of 35 m/s and again roughness of 0.51 and linear velocity of contact point of 70 m/s (Figure 4). Figure 3. Response surface and contours for minimum yield strength of 0.336 MPa. Figure 4. Response surface and contours for middle yield strength of 2.665 MPa. Figure 5. Response surface and contours for maximum yield strength of 4.994 MPa. meaning, they are rejected. 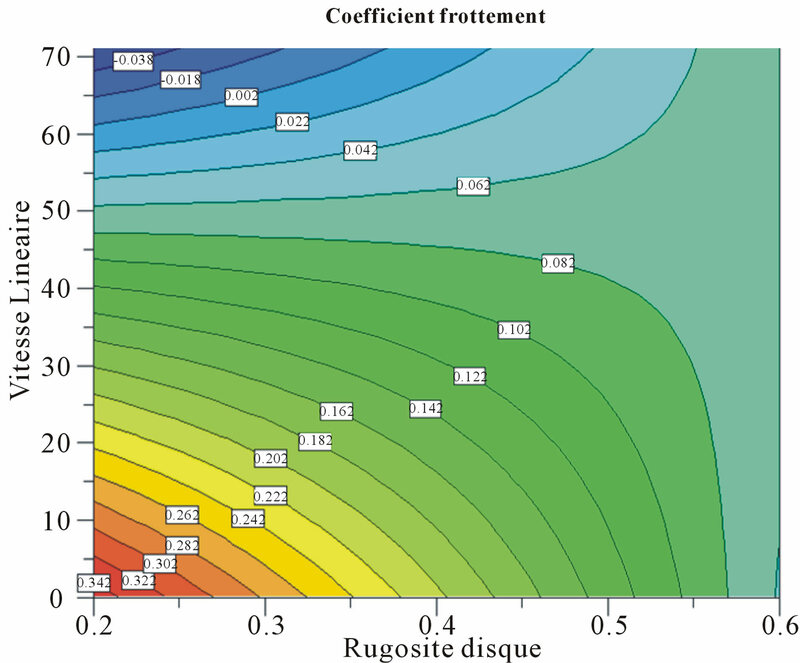 Other coefficient values are high; the working conditions that do appear are avoided (Below a linear velocity of 30 m/s combined roughness of the disk from 0.2 µm to 0.55 µm). When the elastic limit is high i.e. 4.994 MPa (Figure 5), the recommended working area is situated under line isoresponse of –0.002; in other words, the linear velocity must be below 12.1 m/s for values range of disc roughness ranging from 0.2 µm to 0.6 µm. In this last case, great majority of the surface includes negative values, they are physically rejected. The tightness in machineries and equipments by a lip seal of Polytetrafluoroethylene and reinforced by glass fibers which are cut into tiny filaments is ensured by its industrial lifetime depending on the conditions of work and its yield. Its use is interesting because, in addition to the fairly low coefficient of friction, it can withstand at temperatures beyond the common industrial temperature (–150˚C - 250˚C). However, PTFE has some known drawbacks industry. The implementation is special and difficult and it cannot be melt-processed (it is non-moldable material on conventional processing). It is formed by a sintering method. PTFE degrades at 400˚C and is close to its transformation temperature (380˚C), with the release of hydrofluoric acid (corrosive) and gaseous monomer. K. Maekawa and M. Maeda, “Simulation Analysis of Three-Dimensional Continuous Chip, Formation Process,” Seimitsu Kogaku Kaishir Journal of the Japan Society for Precision Engineering, Vol. 59, No. 11, 1993. R. A. Fischer, “Statistical Methods for Research Workers,” Oliver and Boyd, London, 1925. D. Benoist, Y. Tourbier and S. Germain-Tourbier, “Plan d’Expérience: Construction et Analyse,” Tec & Doc. Lavoisier, French Edition, Paris, 1994. Chr. Hoffmann, “Untersuchungen an PTFE-Wellen-Dichtunge,” Dissertation, University Stuttgart, Germany, 1995. 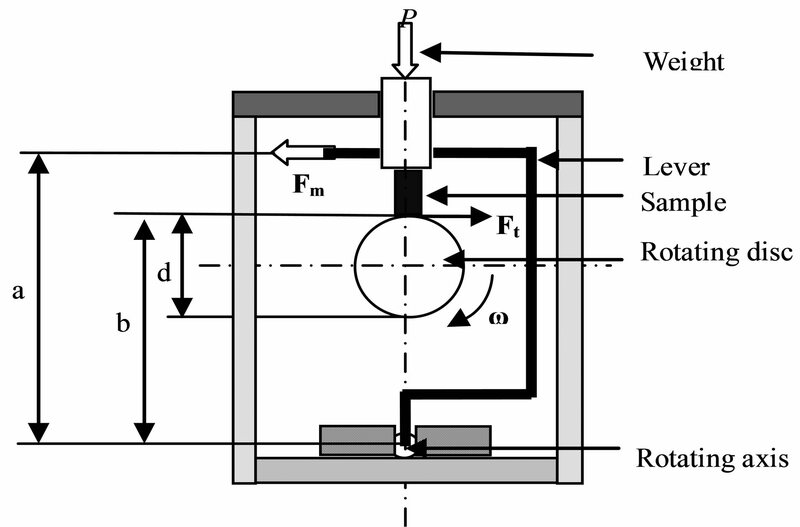 M. W. J. Lewis, “Friction and Wear of PTFE-Based Reciprocating Seals,” ASLE Preprint, No. 84-LC-6A-2, ASLErASME Lubrication, San Diego, 22-24 October, 1984. H. Sui, H. Pohl, A. Oppermann, U. Schomburg, G. Upper and F. Hatch, “Material and Computational Analysis of PTFE Seals, SAE Paper Series 951055,” International Congress and Exposition, Detroit, 27 February-2 March, 1995.